Homeowners across San Diego County are saving significantly on their home energy costs by installing solar photovoltaic (PV) systems and solar water heating systems. Photovoltaic solar panels convert sunlight into electricity, helping residential customers decrease their dependence on SDGE for their electricity needs. By installing a residential solar panel system, you too can produce your own energy at a fraction of the cost of purchasing it through the utility company. Several $0 down options are available including unsecured loans, home equity financing, PACE programs, and leases which can help you see immediate cash flow savings with no out-of-pocket expenses! Combining a custom designed solar PV array with a battery backup system and using our expert energy bill rate structure analysis we bring you Solare Intelligent Energy. Maximizing your solar power for the best possible savings and giving you peace of mind and no worries during power outages. This is the future of solar if you would like to find out more about Solare Intelligent Energy, please click here. The decision to install residential solar panels can be difficult. Knowing how many solar panels to install, which solar contractor, and what financing method is best for you can be daunting. When it comes to producing your own solar power, you want to know that the job has been done right and someone will be there in case you have issues. There are over 400 solar installers operating in San Diego County, and selecting the right contractor can be confusing. Trust your residential solar power project to a company that has a history in the solar-electric business and specializes in designing systems to help San Diego homeowners meet their electricity production needs. Solare Energy has been serving San Diego County for over 25 years as an electrical contractor and has specialized exclusively in solar panel installation since 2009. Our energy analysts will build a system based on your energy consumption profile and help you to determine which financing option is right for you, ensuring that you get the best value possible out of your home solar investment. 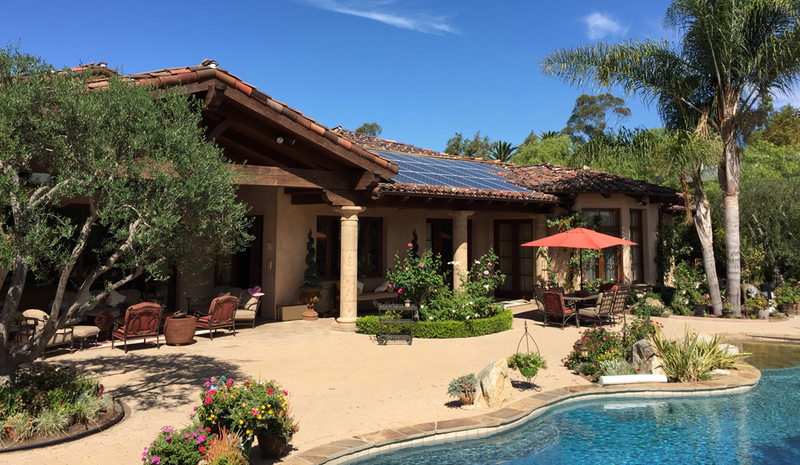 We provide turnkey solar panel installations throughout San Diego County. We handle the entire process for you, from designing the system and processing permits (city, utility, HOA) and incentives, to installing the system, testing and passing inspection for rooftop and ground-mounted residential solar panel systems. The next development in the future of home energy management is batteries. Solare Energy has been installing battery systems for nearly a decade, but the technology has finally become viable for smaller residential energy storage systems charged by home solar installations. Homeowners are becoming increasingly aware about the available options such as the Tesla Powerwall battery, and the utilities plan to move to a Time-of-Use rate structure, charging more for energy used during peak periods of demand. Homeowners with solar panels and battery systems will be able to charge their energy storage systems when the sun is shining, then consume that energy later in the day or evening when their solar PV system isn’t producing as much, protecting them from SDGE’s highest prices. Energy storage systems also provide battery backup in case the grid goes down, allowing you to continue running the vital equipment in your home, such as a refrigerator, communication devices, or lighting. This kind of energy security allows you and your family to rest easy, knowing you’ll never be left out in the dark. Solar water heating is an old idea that is making a comeback with new technology. Solar heating panels concentrate and capture heat for use in the home and pool. Solar water heating is often combined with photovoltaic solar panel systems to provide even more savings on your energy costs. Solar pool heating provides a more comfortable swim experience and can extend usability of your pool by several months. As a full-service company, we take care of everything for you, including system design and permitting (city, utility, HOA), processing incentives, installing the system, testing, inspection, and monitoring. We take care of it all so you can live better with solar. We develop energy use profiles based on past energy bills and inspection of key energy use systems including furnace, air conditioning, pool pumps, water heater, lighting, appliances, and electronic equipment. These assessments are typically required for the Energy Upgrade California and other SDGE incentive programs. We provide certified Building Performance Institute (BPI) home performance analysis and Home Energy Rating System (HERS) energy audits. With an energy efficiency analysis, you’ll be able to discover multiple ways that you can improve your home’s energy performance. Some of these upgrades are as simple as replacing light bulbs with more efficient CFL bulbs or LEDs. Some only require replacing older, inefficient equipment and appliances such as pool pumps or air conditioning units. Other upgrades include improving the building envelope, such as sealing leaks, insulation, etc. All of these energy efficiency upgrades will reduce your electricity and/or gas consumption and help you see better savings on your SDGE bill. Whether you’re looking for an economical answer to your commute or the next wave in luxury automobiles, we can provide cost-benefit analysis based on SDGE tariffs of switching to an electric or plug-in hybrid electric vehicle. We also handle the design, permitting, and installation of electric vehicle charging stations. California has some very attractive incentives that make owning or leasing an electric vehicle more affordable than ever before, and combining your EV with residential solar panels will help you save significantly on your transportation costs as well! When you sign on as a client with Solare Energy, you get the assurance of an established, local business that’s been serving San Diego County for over 25 years. Utilizing online technology, we’re able to monitor your system and if at any time its performance falls below the guaranteed production levels, we’re here to offer support via phone or an on-site visit. All our systems and services are guaranteed, including residential solar panel installation, solar water heating, and energy efficiency measures. If you would like a service call please click here for more information.